I’m busy moving for the next few weeks. So I’ve decided to give you an extra long link party to play with while I concentrate on the mundane tasks of packing/unpacking and transferring utilities. This party will end on June 5th. Then we’ll go back to the regular weekly party. To stretch out the fun, the two post maximum is lifted. Post as much as you like as long as it’s corn-free! (I will be checking.) When I return in June, I’ll post the top five links in a special features post! FYI – I meant to do this last week but I was preempted by a corn-tamination. In case you’re wondering, white board cleaner has massive amounts of corn alcohol in it and I’ve got the brain fog, migraine, congestion, and raw throat to prove it. 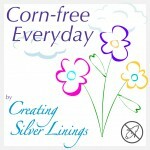 This entry was posted in Art, Autré Chose, Link Parties, Recipes, Tips and tagged corn free, corn-free everyday, healthy living. Bookmark the permalink.